Here's why the stock is falling again on Monday. 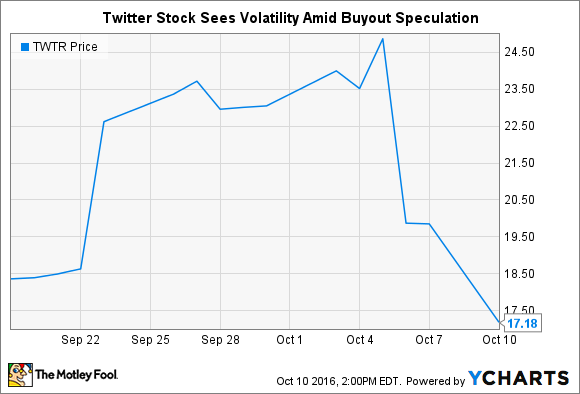 It was just last Thursday when Twitter (NYSE:TWTR) stock fell by about 20% as buyout speculation cooled off a bit. Then, the stock fell by as much as 14.7% on Monday and is down about 13.7% at the time of this writing after a report from Bloomberg said top potential bidders, including salesforce.com, are no longer interested in bidding for the company. Twitter once saw interest from Alphabet Inc.'s Google, Salesforce.com Inc. and Walt Disney Co., all of which consulted with banks on whether to acquire the social-media company. Now all of those suitors are unlikely to make a bid, according to people familiar with the matter. On Friday, Twitter had planned to have a board meeting with outside advisors on a sale but canceled, one of the people said. Buyout speculation first gained steam in September when CNBC said Alphabet, Salesforce, and "other technology companies" were interested in making a bid for Twitter. The report sent shares soaring as much as 23% as investors bet on shares selling at a higher price if the buyout actually occurred. But buyout speculation has led nowhere. The stock is now trading lower than where it was before CNBC's initial report of a possible buyout. All this volatility is a good reminder for investors to refrain from making trades on speculation and short-term expectations. Even after a potential buyout was reported, there was a risk the deal wouldn't go through and there was uncertainty surrounding the price potential suitors would pay. Investors are better off basing their buy and sell decisions for Twitter stock on an assessment of the underlying business.